IN THE SPIRIT OF FLUXUS is an unusual publication of an unusual "museum", the Walker Art Center, published on the occasion of the exhibition about Fluxus organized with the same title at the Walker Art Center from February to June 1993. As the Walker Art Center regards itself not as a traditional museum but as a place for displaying various artistic media: films, books, music, performances, painting, and sculpture the same way this book is not an exhibition catalogue but an installation published and distrubuted in a printed form. Its approach to presenting the wide range of Fluxus activity in a new form thus offering "another aspect of the exhibition" in the "new museum" is grounded and required by the nature of its subject since to speak about "the most radical and experimental anti-art movement of the sixties" is not only problematic because of the lack of a proper terminology but it also raises a couple of serious questions. As Fluxus artists dissolved the conventional forms of art and constantly changed the media of their artistic activity, their work forces the interpreter (the art historian, the audience, and the practicioners of art as well) to reconsider the role of the art/artist, the relationship between action and object, and the boundaries of artistic disciplines. Their isolation from the art institutions and market calls for a new definition of the function of the museum and a new way of exhibiting art. Finally, for an anti-art movement whose goal was to close the gap between the art and life and as such to remain unrecognized, it is always paradoxical to be embraced by the museum. The major achievement of this book is that the publishers bear in mind this dilemma and let the authors of the six essays view Fluxus from different aspects, each of them discussing a single discipline (visual art, performance, music, film) while the first essay by co-organizer of the exibition Elizabeth Armstrong reveals the paradox of such an enterprise and introduces the contributors to this publication. Owen F. Smith´s brief history of Fluxus activities provides a chronological review of the performances and publications in the sixties and the seventies. He examines the historical origins and the conceptual foundation of Fluxus and points out its characteristic features. The significance of this text is that it serves as a point of reference for the other texts. Simon Anderson writes about the radicalism of Maciunas' approach to publication (Maciunas published a great variety of artifacts: newspapers, three-dimensional objects, and editions in boxes and publication for him covered the entire process of mass-producing and distributing the artists´ "free licenced" ideas). 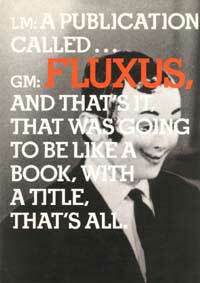 The author argues that publication constituted the main core of Fluxus activity. Kristine Stiles, an artist herself, on the contrary, stresses that Fluxus´s roots are in performance and discusses the critical social dimensions inherent in the centrality of the body, in the racial and sexual aspects of the performances, in the role of humor, and in the evolution of single actions into complex collective rituals. Her global understanding of Fluxus art supported with a philosophical background for the performances is perhaps the most interesting essay in this volume. Douglas Kahn, an audio artist and co-editor of Wireless Imagination, examines the music in terms of the evolution of the twentieth century audio art. He describes sixty examples of performances by twenty-two artists and sees the significance of the Fluxus concerts in breaking down the conventions of musical performance. Bruce Jenkins' essay is a challenging attempt "in the spirit of Fluxus" to present Fluxfilm in three different "takes" adopting the self-referentiality of the Fluxus films for their interpretation. Regarding Nam June Paik´s blank celluloid as a model for the new film, he questions the notion of authorship and the authority of any interpretation. As a conclusion, Andreas Huyssen places Fluxus in a broader cultural context outlining the artistic, social, and political climate of the period. With its openness and plurality of views, this unconventional "catalogue" preserves the spirit of Fluxus: the reader/spectator is free to form his own idea about Fluxusjust like Fluxus artists had their own entirely different views about what it wasout of a wide range of opinions, facts, illustrations, photographs, and the artists'statements and documents attached to the essays.